Wedding planning can be tough going, which is why it’s so essential to get your bridesmaids on board early! Make your bridesmaid proposal memorable with the help of Be My Guest. 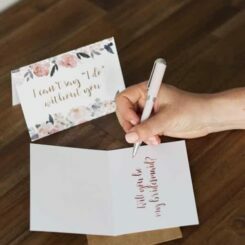 Below is a range of pre-made cards and wine labels you can use to ask your besties to be your bridesmaid. Plus scroll further down the page to check out a quick video on how to easily apply these wine labels. The labels are printed onto freezer-grade adhesive paper, so your sticker will survive chilling in the fridge! 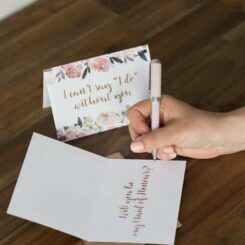 If you are trying to come up with some different ways to “propose” to your bridesmaids, this article from Southern Bride has some neat ideas (and features the bridesmaid range from Be My Guest also).